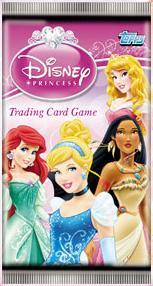 Topps Europe has just launched the Disney Princess Trading Card Game. The game’s 170 cards feature all 11 Disney princesses and include 16 colour-me-in cards, 10 heart-shaped cards, and 27 storytelling cards. Disney Princess TCG Starter Packs retail for £5 and come with a collector binder, a collector guide, a sticker sheet of gold hearts, and one booster pack. Six-card booster packs retail for £1 each. What would you charge to ship to the US?